It looks like someone is ready for the doggie bag. Welcome to another installment of the Saturday Pet Blogger Hop! You’ve found the right place to connect with other pet lovers. Whether you are a seasoned blogger, one who loves reading pet blogs, or if you’re just thinking about starting your own blog – there is definitely something here for you. Acquaint yourself and enjoy – this is your resource, so use it as you see fit! Of course, you have to follow the rules, so let’s get to that. Get those links in and have fun. Link up your pet blog name and URL using the Linky Tool below. You only need to add your link once to be seen on all the Saturday Pet Blogger Blog Hop Linky Tools for that week. Note that if your blog is not pet related your link will be removed. 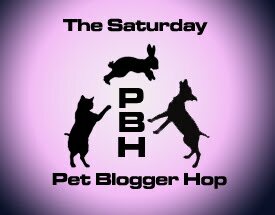 Grab the “Saturday Pet Blogger Blog Hop” button on the right hand side of this site and include it in your Saturday Blog hop post so that your readers will know what is going on. *Note – posting is optional. Feel free to just link and follow. Follow your co-hosts listed in the first 3 slots of the Linky Tool. Follow as many other blogs on the linky as you’d like. Take a moment to comment on the blogs telling them you’re from the blog hop. Follow back when you get a new follower through the Saturday Pet Blogger Hop. Hahah! This video must have taken SO LONG to make – I’m impressed! OMG! That is so damn funny! LMAO! Thanks for hosting another week of the Saturday Pet Blogger Hop. We’ve met so many great friends through the hop. Those videos always crack me up! I LOVE those videos. Hadn’t seen this one though. Hysterical!! Have a great weekend!! I love love love this stuff! Corny and to-die-for funny! Thank for a great laugh and a good tearjerker! That was too funny!! Those were some very patient dogs!! Loved it! Amazingly well behaved dogs! They would put some kids to shame! That was highly entertaining! I appreciate the work and humor that goes into these videos. And cute dogs are always fun to watch. But I find these videos vaguely disturbing the same way I feel funny watching children wear make up. Anyway, thanks for all the great content over the week and for hosting the blog hop. Make you a sandwich?! There’s leftovers–my preference to a sandwich on any day. LOL I love these videos. They’re certainly good for a great laugh. It’s a series? Who knew. 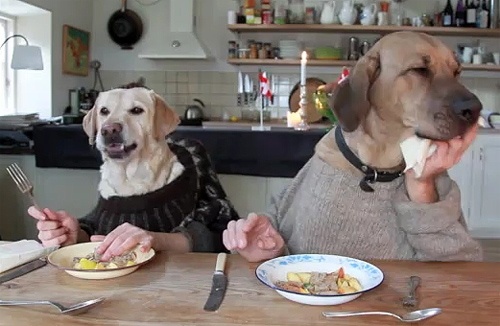 Thanks (I think) for introducing me to the surreal world of Dogs Dining in Clothes. Just hopped by for a great laugh! and to say thanks for another GREAT Saturday blog hop! I’m impressed with the work that went into this! Happy Blog Hop! That’s a riot! What good “wait” skills those dogs have… and no drooling when the food was right there! Well done! The talent and time it took to make these videos is most impressive. We love them. I just bought some killer sourdough bread and I have a lovely roast beef. Do you want mustard or mayo? If you’re ever in LA! Swing by! How did they do this without poking a dog in the eye with a fork! That was my main worry. Fabulous! Lexi and I love it! They are neater than my husband. How simply adorable, the cutest expressions and hand movements…..so, so funny! Don’cha hate it when your fork comes up empty? I really did laugh out loud! That was great, so fun. What patience these dogs had. I have to watch that video at least twice a day. It has me rolling on the floor each time!